I used to hate making flying geese blocks, with rectangles and squares at the corners to trim. They never came out very well, no matter how careful I was. Then I discovered Eleanor Burns' method, and now I actually LIKE making those geese! They start with two different squares of fabric. For four 3"x6" flying geese blocks, you start with a 9 inch square of background fabric and a 7 1/2 inch square of geese fabric. Center the smaller geese square on the background fabric, right sides together, and draw a diagonal line from corner to corner. It can be in pencil or ink since it will be your cutting line. Sew 1/4 inch on either side of the line, then cut the two pieces apart. 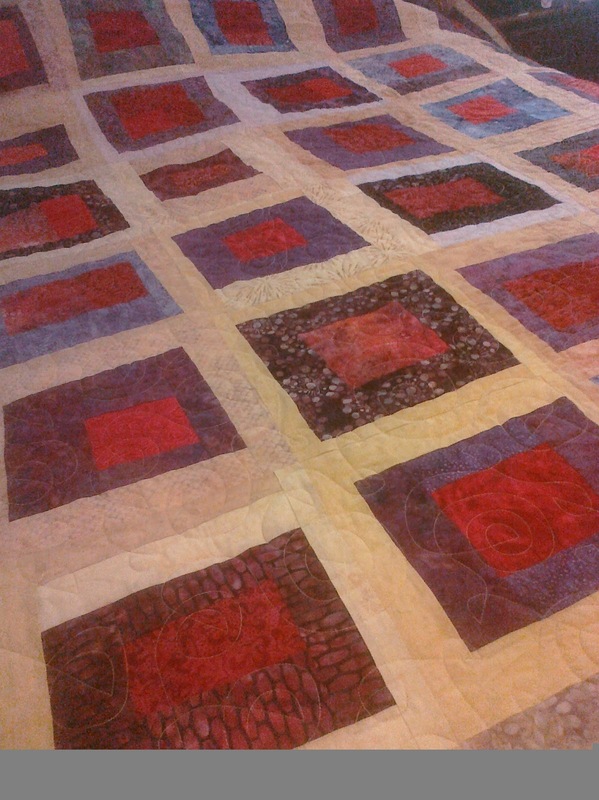 Press each odd-shaped piece towards the larger, background fabric. Now, put the two odd-shaped pieces right sides together, with the right side of the geese fabric facing the right side of the background fabric. The seams will NOT match. They will be offset by about an inch. Draw another diagonal line from corner to corner across the seam. Sew 1/4 inch on either side of the line, then cut the two pieces apart on the line. Make a snip in the seam allowance halfway between the two intersecting seams. Press the seams toward the background fabric. You will now have two squares, each with two geese. On the front, the two geese will be off-center. Position the Eleanor Burns flying geese ruler over one of the geese, lining up the lines with the seams of the geese. Trim all four sides. I like to use my rotating mat for this step so that I don't have to move either the fabric or the ruler. Trim the other geese and you now have two flying geese with very little waste left over. Trim both geese on the second square and you'll have 4 perfect flying geese squares! It's not "today is the first day of the rest of my life," but this IS a start of something new. I've never been a journaller (is that even a word?) but I'll give this a try. 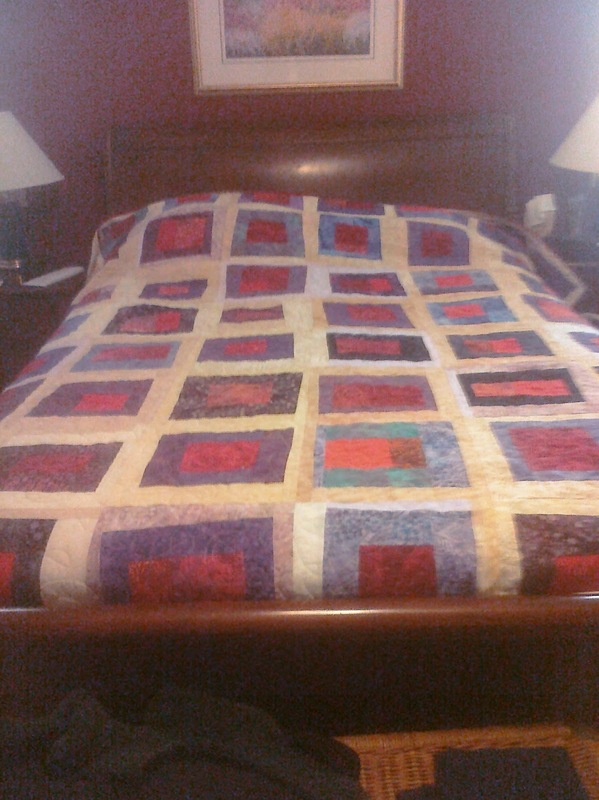 I finished a bed quilt a couple of weeks ago, a quilt for me for once. I give most of my quilts away, so it's nice to see the results of my labor every day. It's based loosely on a Denise Schmidt design, Pretty Square. It's 96"x96", plenty big enough for our queen bed. Now I just need to make a couple of pillows to go with it. Mr. T will be gone all weekend. I'm looking forward to having the house all to myself!